So Apple announced a new G5-based imac, with the disappointing detail that it contains an 18 month old graphics card. (The graphics industry has 6 month product cycles, so this translates to roughly 3 versions out of date). It�s a combination that delivers unparalleled 2D and 3D graphics performance and an immersive, photorealistic gaming experience with three times the frame rate of previous-generation processors. This is probably the worst graphic I’ve ever seen. It looks like it contains information — it’s got system specs and even a benchmark resolution — but that’s just a smokescreen. 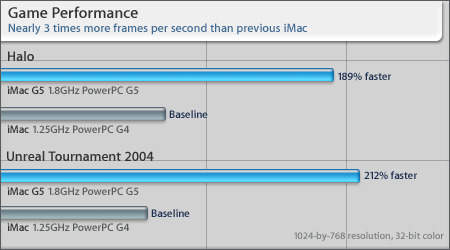 The graphic is relative, and doesn’t tell you if “baseline” is 60 frames per second or 6. Apple can get away with this sort of manipulation because its customers tend to be insulated from the rest of the PC industry. The FX5200 is actually an “entry level” version versus its cousins the 5700 and 5900, and has been surpassed by the next-generation 6800 series. If Apple were to post actual framerates it would not compare so well to the x86 world, so they keep everything within their own universe. Apple isn’t alone in presenting data poorly. TardOCP is famous for its data-filled, yet totally useless diagrams. Note the inconsistant resolution settings and unreadable colors!